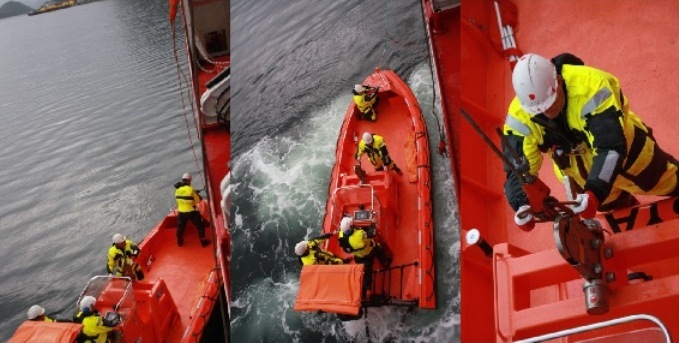 According to Atlantic Offshore’s exercise plan for safety and emergency preparedness training, vessels holds regular drills and exercises on board in order to maintain and increase the quality of rescue and recovery service, and the level of competence for their seafarers. 9th August three different verification exercises was held on board Ocean Alden. The exercises were executed both alongside Florø Fjordbase and in Hellefjorden northwest of Florø. Ocean Alden preformed ordinary operation while the excises took place onboard. One of the exercises focused on an unconscious and hypothermic person found floating in the sea, taken on board the boat, and the transferred to Ocean Alden for treatment. The objective of the exercise was to verify work teams responsible for the hospital under the care of unconscious hypothermic person, related to curriculum OLF first aid course – including the preparation and establishment of defibrillator. The exercise was preformed in accordance with Atlantic Academy and our training partner OilComp.